The goal of our Healthy eating policy is to promote an awareness of healthier eating among pupils, teachers and parents. It is recognised that eating habits are established at a young age; therefore it is essential that young children choose healthy options as early as possible. We believe this should ensure good foundations for health in the present and in the future. We focused on this policy to support parents and pupils around developing healthy eating habits at an early age. To support parents and children in making healthy, enjoyable decisions around food. To develop nutritional awareness, i.e. ingredients in foods. To support the school’s environmental policy – reusable containers, minimise wrappers. The food pyramid shows the different types of food we choose from and helps us to know how much of each food type we need to eat. We need to eat more of the foods at the bottom of the pyramid than we do the foods at the top. By following the recommendations of the food pyramid you can be sure that you are eating a balanced diet. The top section of the food pyramid is actually separated from the rest of the pyramid to emphasise that they are not necessary for a balanced diet. They should be eaten in very small amounts. The bottom of the pyramid is the biggest part of the pyramid. It contains the foods you should eat lots of. 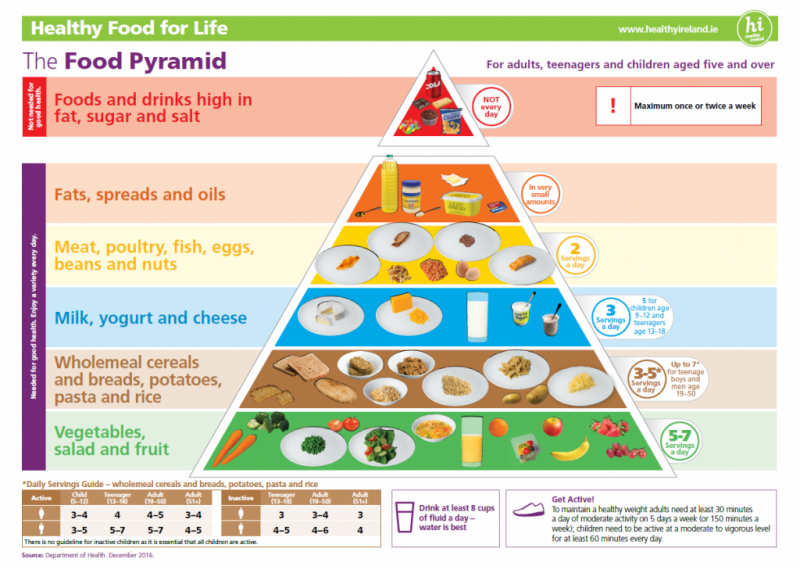 The middle of the pyramid contains foods you should eat some of, but not too much of. Lunch should provide one third of a child’s food requirements for the day. The most effective way to plan a healthy lunch is to include one food from each of the food groups – two pieces of fruit or vegetable, milk/yoghurt, two slices of bread and meat/poultry/cheese. Each child should have enough lunch for the whole day. Healthier choices of drink include water, milk and unsweetened juice. The school staff will provide positive modelling and supportive attitudes to encourage healthy eating. Children may take a small item of lunch outdoors to eat (e.g. an apple, something from the bread / cereal / pasta group). Younger children may be allowed some class time to eat indoors before going to play. This can be particularly important for Junior Infants in the first term. Children are given 10 minutes to commence their lunch before going outside to the yard. Children are not allowed to walk around the room while eating. This is necessary in terms of good eating etiquette and also to minimise opportunity for spillage. Children are taught that treat items should always be eaten last once all other items have been eaten. Children should not exchange food items or save food to be eaten on the way home after school. In the winter months (between Hallowe’en and February mid-term holidays) children are permitted to bring warm soup in a flask. It is not possible or safe to provide hot water in school for large groups of children to make instant soup. The water in school is treated and tested every year by the HSE to ensure that it is perfectly safe to drink.